Obviously, yesterday's election results for the Austin ISD bond seem...off. 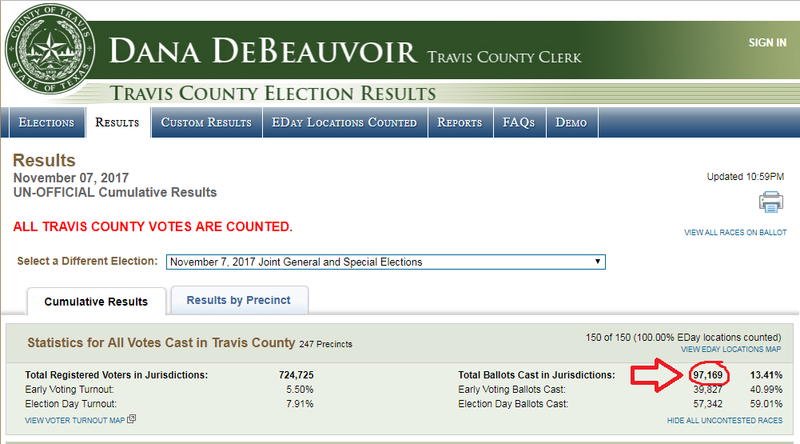 According to Travis County, over 97,000 people voted countywide. This would be the second highest "turnout" in Travis County for a constitutional amendment election since 1997 (Travis county doesn't have records past that on their website; going back further would require open records requests). The only time turnout for a constitutional amendment election was higher was 2005, when the Texas Marriage Amendment was on the ballot. In 2015, by contrast, the turnout was a smidge over 75k. In 2013, WITH a special legislative election on the ballot, turnout was around 85k. In general, over the past decade, constitutional amendment elections have seen turnout in the mid-70k's (Note: It would be too time consuming to post the individual links, but you can see the information for yourself here). So, we're expected to believe that this year's constitutional amendment election saw higher public participation than any other constitutional amendment election that didn't include the massively controversial marriage question...ever. This despite the fact that previous elections (most notably 2013) have also seen issues on the ballot that were equally controversial as last night's bond. We suppose that's not impossible, but neither does it seem entirely likely. Travis county is claiming that over 40,000 people voted in Austin ISD yesterday. That seems inconsistent with our personal observations. We worked one of the consistently busiest polling places in the county all afternoon yesterday and we doubt more than 3 or 400 people voted during that entire time (and even the 400 figure is us bending over backwards to give them the benefit of the doubt). But, for the sake of discussion, let's give them the 400 figure. Furthermore, let's assume that 1500 total people voted at that location yesterday (to account for the hours we weren't at the polling location). Even granting them those very generous assumptions, that still means over 38,000 people voted at historically less busy locations yesterday. Again, that might not be impossible, but neither does it seem exactly likely. So, what could have happened?!? Travis county saw a massive surge in voter registrations for the 2016 presidential elections. We suppose it's possible that 10 to 20,000 of those first time presidential general election voters discovered a new love for civic activism and showed up to vote for the constitutional amendments. That being said, first time Presidential voters don't historically tend to be the type of person who participates in obscure state/local questions. If that's the case, it shouldn't be too difficult to find the voter files of the folks who registered last year who subsequently voted yesterday. Of course, if these unlikely events didn't happen, there's another possibility. Bottom Line: Sometimes, unlikely events happen. But the reason that they're unlikely is that they don't happen often. More investigation is needed.